About two years ago, farm equipment dealer Doug Martin realized it was time to make a change. As the general manager of family-owned Paul Martin & Sons in Napoleon, Ohio, he saw an opportunity to add precision farming products, based on growing interest from customers. 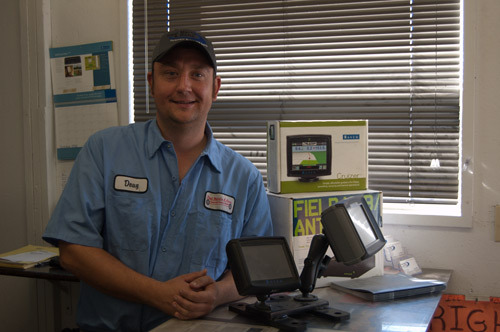 “I had sold light bars with another company, but it got to the point here that if we weren’t investing in the technology, the viability of the dealership could be at risk,” says Martin, who serves as the precision farming salesperson at the five-employee, single-store dealership. As a shortline dealer of primarily seeding and tillage equipment, with a substantial farm equipment rental business, Martin acknowledges that blending precision products into the mix took research, patience and a progressive mindset. One of the first things he considered before becoming a precision dealer for Raven Industries was how to get his customers — mainly small operators with about 500 acres — a hands-on experience with the technology. Doug Martin, of Paul Martin & Sons in Napoleon, Ohio, stands with one of the Raven product displays in the dealership. For him, it’s important to get the technology in front of customers and give them an opportunity to use it in the field. On more than one occasion, Martin has rented his own tractors equipped with auto-steer to give customers unfamiliar with precision farming a chance to play with the technology. In some cases, customers have taken the initiative and tried the auto-steer, while others have asked after the fact about the system. Given that the technology has proven to be at least a conversation starter for equipment renters, Martin says he sees an opportunity to capitalize on the interest. One thing to consider before including precision technology on rental equipment, Martin says, is making sure customers have at least a basic understanding of what to expect from the system. That means taking the time to train customers, which also means being available if they have questions. Martin says he isn’t interested in the “quick sale” of precision equipment and he simply views the inclusion of technology on rental machinery as an another way to forge customer loyalty. Precision technology can also help with the eventual sale of rental equipment. Martin says the dealership sold a used tractor with full RTK and an auto-steer system that it can now replace with a newer model to rent.